The holiday season is upon us! Lights are going up, orders for Thanksgiving turkeys are posted at grocery stores, and I even got the Christmas blend at Starbucks this morning! As we plan our holiday meals, celebrations and gifts, it is also the season to give back to our friends, families, colleagues and communities. DC EcoWomen has been hard at work this year—and every year—since 2003 to empower environmental women in the greater DVM. We have a hard-working board of 22 women, who collectively work to organize and manage our organization of nearly 6,000 members! Together, we put on over 40 events a year that run the gamut from professional development to outdoor activities and outings, to our signature EcoHour, where professional women can come together to network and find community. I’m proud of all that we have accomplished: since 2004 we have put on over 160 EcoHours and featured women leaders from local and national environmental groups, environmental journalists and bloggers, and leaders in the governmental arena. In 2017 alone, we have featured strategists from leading conservation groups, cleaned up pollution at our coastline, arranged conservation tours at the zoo, and now we are encouraging women to use reusable shopping bags through our Nickels for Non-Profits partnership with Whole Foods in Montgomery County. But wait, we are not done! Next Tuesday, Nov 21, we are hosting an EcoHour with Dr. Helen E. Fox, senior director of Our Changing Planet grants program at the National Geographic Society. She will share insights from her 20+ years of experience strengthening science and marine conservation. The following Tuesday, November 28, is #GivingTuesday! What is #GivingTuesday you might ask? Besides a hashtag, it is an international day of giving, whether it is through giving your time, your money or your voice. 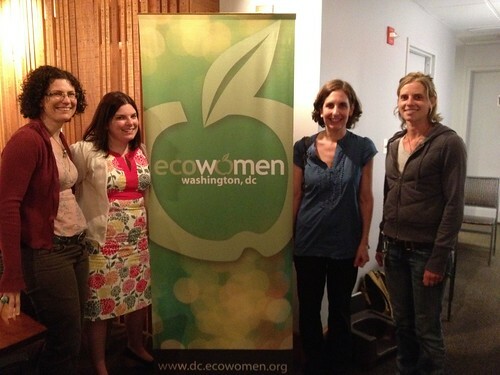 Do you have a story about how DC EcoWomen has benefited you? Share it! This year, I hope that you will consider giving to DC EcoWomen, an organization that gives back all year long. Please join with our community, come out to our events and get involved! There are volunteer opportunities, and opportunities to express your leadership by participating on our board. Your donation will go towards the development of women as leaders in the environmental community. Speaking of developing women leaders, are you ready to take your career to the next level? Join us at a Leveling Up workshop on Saturday, December 2. This comprehensive skills-building workshop where a team of experts will walk you through how to manage a team, measure your effectiveness, present with confidence, and deliberately manage and shape your career. You’ll also learn about finding mentors and career coaches, cultivating connections, branding yourself, and much more! As we close out 2017 and move into 2018, my Co-Chair Tamara Toles O’Laughlin and I are excited to see how we can develop our board and our offerings to our membership. But, we need your support to take DC EcoWomen to the next level. “April and I will make change that support and evolves our mission to broaden our service to all the women who make up our community, while continuing to be the hub for vanguard leadership and programming. “Watch this space as we tinker with the definition of membership, develop affinity groups to reach the seasoned members of our community and make the most of the forty events the DC chapter puts on each year. I couldn’t have said it better myself! I am wishing you and yours a wonderful holiday season!